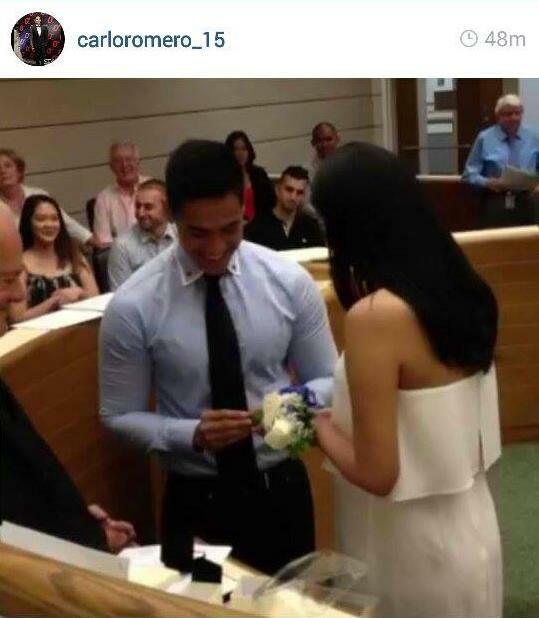 Real life couple and soon-to-be parents Carlo Romero and Wendy Tabusalla finally exchanged I Dos in a civil ceremony in the US. The couple who are now in Carlo's hometown Chicago shared about the beginning of their forever through their respective Instagram accounts. "It's FINALLY official presenting Mrs. Romero," he wrote as a caption. Wendy for her part expressed excitement over this new chapter in their lives as husband and wife. "'Now i'm in a whole new world with you.' Can't wait to spend the rest of my life with you," she posted after quoting a line from the song A Whole New World from the Disney film Aladdin. Congratulatory messages rained for the couple who just a few weeks back announced that they are expecting their first baby. It was inside the famous yellow house where Wendy and Carlo's romance began while they're still part of the reality show Pinoy Big Brother Unlimited in 2011 as housemates. The couple of three years joined the same season where Slater Young was declared as the Big Winner.